Posted on 6/12/2017 by Lori Moriarty. 0 Comments. You need SAP training and have zero time to do it. We get it. We know the facts because we just wrapped up our 2017 SAP Training Survey and 25% of SAP professionals have told us they don’t have enough time for training. But you can get the training you need and get it done on your schedule. You already work every hour of your day. Just the thought of taking hours and hours out of daily tasks to get much needed SAP training is daunting. But, I have some good news for you. Our average SAP student takes about 10 ½ days to complete a course. The average course is about 6 ½ hours long. This means you only need about 30 minutes a day to dedicate to your success. You can be on your way to SAP certification today. Aristotle said, “We are what we repeatedly do. Excellence then, is not an act, but a habit.” He knew all you had to do was get in the habit of a little training every day to become excellent. Let’s take his advice. 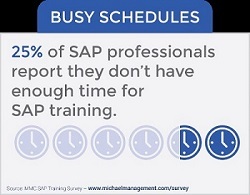 We asked our SAP Professionals how long they wanted their training courses to be. Almost half of you said that 1 hour, plus/minus 30 minutes is the sweet spot. Looks like we are ready to get to 5 tips to get you learning today. Eliminate options - put your money on the line. 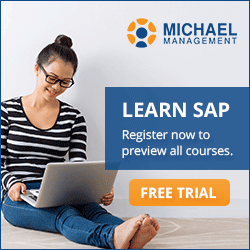 Buy that SAP course and create the number one motivating factor for many people. You paid for it, now use it. You can also make the decision to save more money by purchasing our unlimited subscription. Now you have an entire year to get your training done. Schedule time early - learning takes brain power. Set time aside first thing in the morning while you are still fresh. Set small goals - This is an easy one. Buy the course, put a time on your calendar for the first lesson and then do it. Goal number one is to start. Celebrate - Completed that first lesson? Nice work, celebrate and realize that it was not that bad. Passed the certification exam. Good for you! Now add it to your resume and LinkedIn profile. Get back on track – Things will arise and you will miss your time for a few days. Don’t quit. Just like that time you ate the chocolate cake when you were dieting. You start over the next day. Have an apple and spend the 30 minutes. Get into the habit of overcoming training obstacles. All lessons are about 30 minutes long to fit into your tight schedule. You will have immediate access to all interactive SAP training material. Time to take action! What is your biggest challenge to overcome in getting your SAP Training? Lori is our Client Specialist & Social Media Manager here at Michael Management, she has experience in client services management, and social. Please feel free to contact her if you have any questions!